Uplift the actions of brave protesters, attend a vigil, or head to DC. Senator Mitch McConnell has said that the Senate will vote on Brett Kavanaugh’s nomination to the Supreme Court by the end of this week. If the sexual assault allegations didn’t already render Kavanaugh unfit for a lifetime appointment, his partisan rant against Democrats and the indications that he repeatedly lied under oath certainly would. Now is our chance to stop him. Sign up for Take Action Now. 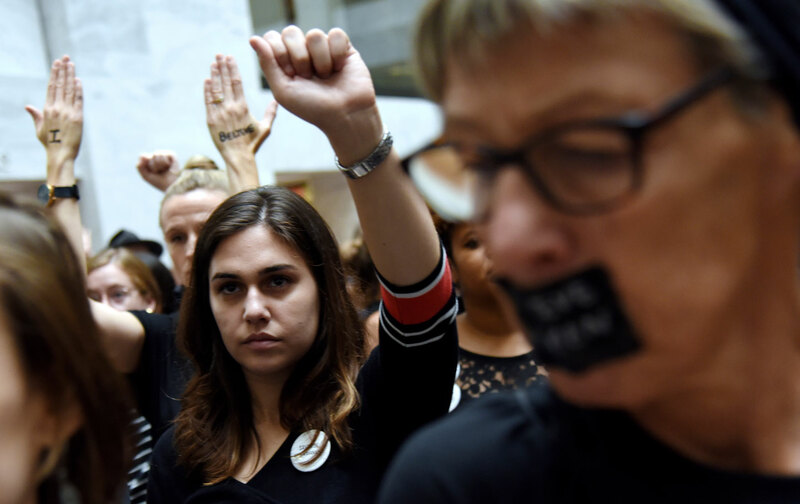 This week’s Take Action Now is focused on how you can stand up for survivors and demand that the Senate reject Kavanaugh immediately. Take Action Now gives you three meaningful actions you can take each week, whatever your schedule. Sign up here to get actions like these in your inbox every Tuesday. If your senators haven’t taken a position yet, you know what to do: keep calling at 202-224-3121. And no matter where you live, uplift the work of the brave protesters confronting their senators by using the #BeaHero and #CancelKavanaugh hashtags and sharing their videos and posts on Twitter, Facebook, or anywhere else you communicate with friends and family. Just yesterday, a group of activists from Mainers for Accountable Leadership were arrested for refusing to leave Susan Collins’s office and women in DC directly confronted Senators Ted Cruz, Mitch McConnell, and David Perdue. A coalition of groups including MoveOn are helping people across the country organize vigils Wednesday night to show that there are thousands of us who believe survivors and want the Senate to reject Kavanaugh. Find a vigil near you or sign up to create your own (you’ll have help!). If you can, now is the time to make it out to DC to confront your senators in person. Sign up here to join anytime this week. Organizers will plug you into this week’s actions and, if possible, help with your transportation and housing. You can also find more information here.